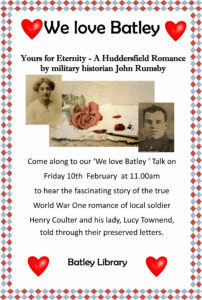 Valentine’s Day is nearly upon us and love is in the air at Batley Library. On the 10th February we will be holding the ‘We Love Batley’ event, which will include a variety of events. 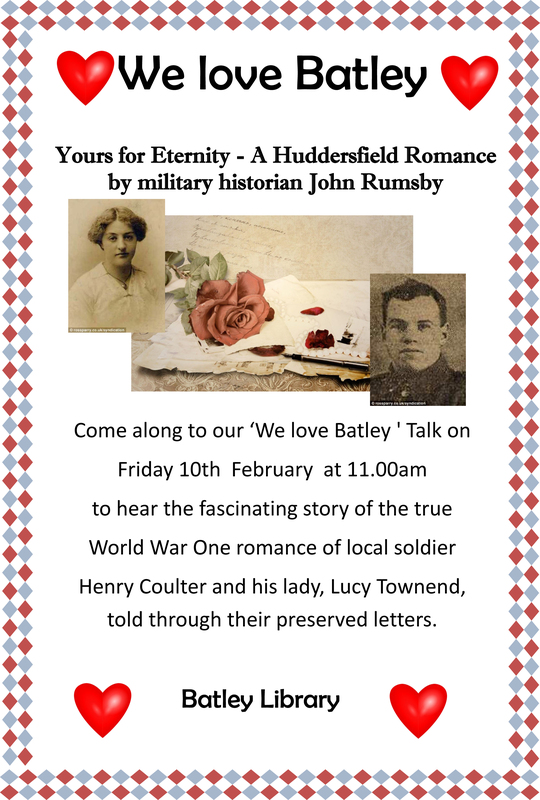 At 11am local military historian John Rumbsby will be joining us to tell us the tale of local soldier Henry Coulter and his World War One romance with Lucy Tow nend, told exclusively via the letters they sent each other. The event is free and there is no need to book, just turn up! We will also be showing a short film made by Friends of Batley Library Chairman, Simon Roadnight, starring YOU. Or, potentially you. Simon will be in the library with his camera on Thursday 26th January and Thursday 2nd February between 12:30 and 13:30 so you can tell him about what you love about Batley. It could be a story about the town, your childhood, your family, anything! If that wasn’t enough, starting now and running beyond Valentine’s Day, we are holding a ‘Blind Date With a Book’ competition. Take out one of our mystery books home on blind date and you could be in with a chance of winning some vouchers for local businesses. The top prize is a £20 voucher for Hometown Diner, followed by a £10 for Spices and Rices and two third prizes of £5 vouchers for Gelato Passion. You never know, you could meet your new favourite book!